Judy's Doll Shop | Mini Corolline - "Coco"
At 8 inches tall, Coco just the right size to tuck into your backpack or shoulder bag. 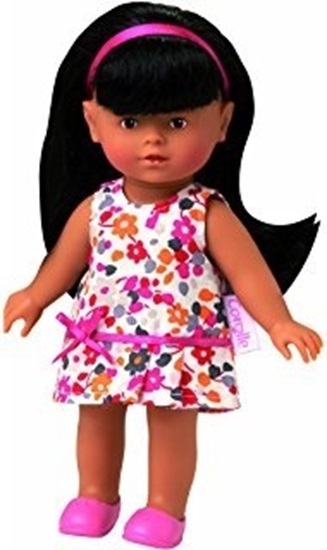 This petite doll has a sweet face and long, silky black hair that's ready for combing and styling. Corolle's Mini Corolline toddlers are specially designed to go everywhere with your little one. Featuring the signature vanilla scent and made from the highest quality materials, Mini Corolline dolls are ready to go anywhere. At just 8 inches tall, Mini Corolline Coco is Corolle's smallest play doll. She is the perfect size to tuck into a backpack or a pocket. Mini Corolline Coco has an all-vinyl body and gorgeous, life-like brown eyes. Her long, coco-colored hair is comb-able and is always fun for your little one to fashion. Mini Corolline Coco comes in a beautiful white dress with pink, orange and blue flowers on it and a thin sash made of pink ribbon. She also wears a bright pink headband. Coco is 8 inches tall and perfect for ages 3 and up.